MFT Sweden Ltd helps individuals, groups and organizations to develop mentally and physically in order to get what they want! MFT – Every day use. MFT – Lecturing and conference. MFT – Food, training & sleep. These different areas have a lot in common but also things that separate them. 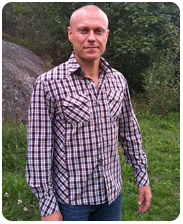 MFT Sweden Ltd works with these areas separately or in combination depending on your preferences. Below follows a description of each one of them. How can you develop with the help from an individually suited MFT program? In life, with friends, in family, career, sports or in love situations occur that you do not want and sometimes you want to make what is already good even better. Maybe you want to strengthen your self confidence or self esteem? Regardless there is a number of situation where your ways of thinking, feeling and behaving not give you the wanted outcome in the given context and you feel the need for a change. To be able to deside which thoughts, feelings and behaviour bring you closer to where you want and which ones take you further away you need to be able to separate what is constructive and what is detructive given your goals and at the same time make very clear to yourself which combination og thoughts, feelings and behaviour put you in your optimum stage given the conditions at hand. MFT Sweden Ltd works with it´s own definition of mental strenght and with that in focus construct individually adapted mental training programs that will show you in detail know how you can learn how to think, feel and behave to maximize the possibility to reach set goals. An important part of this work is to become aware of what you think, feel and do and what functions these reactions fill for you. You need to understand and accept yourself to be able to change the parts of you that hold you back. Another important part of MFT is that it is being intergrated in every day life systematically since changing what has been learnt over long periods of time take time to unlearn and relearn and you need to go through that process in order to get what you want. Everybody are different and need their unique way to act to create maximum power of break through. MFT Sweden Ltd help you to analyze what needs to be changed och constructs mental traing programs that tell you exactly how you need to train in order to maximize possibilities for life to become the way you want it to be. What does it mean to construct a individually suited MFT program? The first step to change this is to make consciuos what is unconscious and thereby aknowledging to yourself thoughts, feelings and behavior that are in your way on the path to your goals. It is also important to understand where in your learning history these thoughts feelings and behaviour have been established. The second step is to clarify new more constructive, thoughts, feelings and behavior that create new ways for you in getting where you want. This is done through in depth conversations and observations. The third step is to systematically use the new thoughts, feelings and behavior and thereby implement more constructive ways of dealing with old problematic situations. You will look upon life with different eyes and will get in charge of new mental tools. The fourth and last step is to measure to what extent you have changed in the ways your MFT program intended. You will get a concrete measure of your mental fulfilment. To be able to collect data for your program we need to meet to talk. Depending on what you want to change and the degree of what you experience is tough for you the time for talk will vary. During our conversation we will clarify what you want to achieve, find a constructive way of working together, construct a individually suited MFT program that will exatcly tell you how you should train to reach your goals and find ways of measuring your progress. Maybe you also need to be observed in the context you want to improve yourself if it proves to be a beneficial way for us to make your subconsious consious. When you train mentally you will notice that what was once unexplainable and difficult gets more understandable and possible to cope with depending on the resources and effort you put in to improve yourself. Deal with what is stopping you inside to get where you want in life by contacting MFT Sweden Ltd under the headline contact. This branch within MFT speaks especially to anyone that wants to improve mentally as an athlete and strive for better and more consistent achievements. It can include dealing ewith nervousness, anger, decreasing the differences between a good and a bad performance, having a mental strategy during competition or just learning to enjoy yor sport! MFT-sports have the same for steps as MFT – everyday use, review conversation, identifying changes, mental training and measuring the achieved progress. What separates the branches is that the condition of thoughts, feelings and behaviour in which you will achieve your best result in sports are different from the thoughts, feelings and behaviour that will make you constructive in everyday situations. But both branches lie upon the same theoretical psychotherapeutic foundation. To improve your athletic performance it is very important that you have a well thought through training mental strategy that deals with psychologically demanding situations during training and competition. In addition it is crucial that you make mental fulfilment training a part of your everyday training. MFT is as important to you as other parts of your training if you want to become a great athlete. If you use an individually suited MFT program you will access a detailed and efficient mental strategy consisting of five mental abilities that are individually adapted. Consiousness. You need to practice to in each moment become aware of what you think, fell and how you behave when you perform well to be able to distinguish between thoughts, feelings and behavior that are constructive and destructive to your performance. Knowledge of your optimum stage of performance. You need to, as thorough as possible, describe what thoughts, feelings and behavior you use when you achieve your best results. In order to do that you can use memories of your best performance. What did you feel, think, taste, smell, see, what happened and how did you behave at that particular occation? 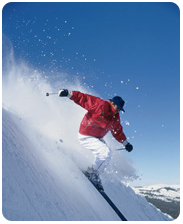 Learn how to get in contact with your optimum conditions for performance. Transfer ability. When you perform situations will occur when the way you think, feel and behave gets destructive instead of constructive to your result. Your task is to learn how to, at all times, search for your optimum inner stage. If you experience yourself using destructive, thoughts, feelings and behavior you need to be able to get in contact with your optimum stage as soon as possible. This is done by using a series of individually adapted mental tools including breathing, disruption of destructive sequence, inner dialogue and thought control. The ability to distinguish between thoughts, feelings and behavior. You will also need to learn how to separate what you think, what you feel and how you behave because they are all three different mental processes that are part of each other and often in action at the same time. You need to learn how to separate constructive and destructive thoughts, feelings and behavior. Knowledge of how thoughts, feelings and behaviors are connected and affect each other. Finally it is important to understand that thoughts, feelings and behavior are intimately connected and interrelated parts of the same system. To be able to stay in your optimum stage of performance you need learn how to deal with your own thoughts, feeling and behavior at the same time. Regardless of if you are in a working group, group of friends, team, union, control group, leadership group or project group you will have a need for reaching that group`s goals. To maximize your possibilities to succeed you need measurable goals that everybody included are motivated to reach. Everybody need to know who does what, when and how and have the possibility to get running goalcorrecting feedback on what need to be done to reach the goals more efficiently. You need to have good interpersonal relationships where everybody´s strong sides complement the context at hand. You need to become aware of how each and every person´s behaviour affect and is interconnected to everybody else`s. The pupuse of feedback have to be to highlight what is good and to correct what needs to be changed in order to make things even better. You need to be motivated to act syncronised and give time to celebrate when you progress and develop. 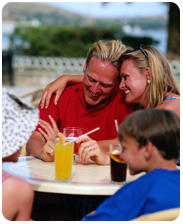 MFT Sweden Ltd helps your group to get the most of your capacity in the aspects important for you. To make your organization generate the desired result all included elements need to cooperate effectively with one another and act in a way that consumes the least amount of energy possible to reach set goals. It does not matter if you are in finance, agriculture, car industry, education, sports, beauty industry or other fields of market because every organization need similar fundamental psychological characteristics to be successful in their activity. To be able to establish this optimum stage of organization you need to find balance between the vital parts of the organization. How can you develop mentally with mental fulfilment training – MFT? Mental preparations before, during and after an accomplishment. Challenge yourself and expand your life space. How can you, in your organization, contribute to your fellow worker´s increased motivation, self esteem and self confidence? In which ways do your thoughts, feelings and behaviour function for you and how do your psychological defenses hinder you to reach your goal? How can you change this? How can you harness and direct a lot of psychological energy in your organization through more effective feedback, handeling of conflict, clearer description of tasks, more concreate goals and space for physical training in everyday work? 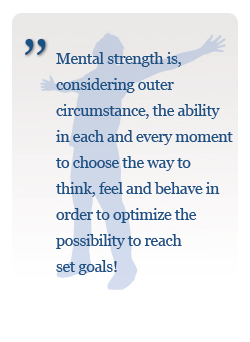 How can your organization become mentally stronger and hence increase possibility to reach set goals? How can your working group direct it`s energy, find focus and become increasingly effective? How can you find joy and motivation in everyday life? You You can order a lecture of desired lenght and content that you think you need to elevate your own or your organization´s capacity. 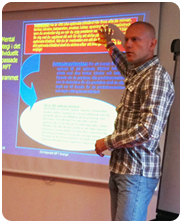 MFT Sweden Ltd use Powe Point presentations in combination with music, motion pictures and psychological interventions with the audience and strives to create a lecturing climate that stimulates to a dialogue between the people listening and the lecturer. If that dialogue becomes vibrant and alive the lecture can transform into a strong positive experience. As a leader in a organization it could be very beneficial to actualize different individual-, group- or organizational psychological perspective on the business during the conference or as means for the personel to get new ways of looking at the work environment. 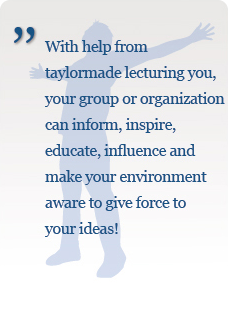 A well aimed taylor made lecture in the realms of the broad field of psychology might be what your company need to take a step towards a more developing way of interacting with the environment. Use your own imagination and try to figure out what knowledge in psychology your company can benefit from and MFT Sweden Ltd can be a business partner that can help you deliver what you need. If you are not sure what you need but are still interested in how psychology can help you, MFT Sweden Ltd can give you some suggestions of areas that could be useful. Your company arrange regularly conferences to give the organization energy and direct the activity in intented ways. MFT Sweden Ltd can help you to increase value of the conference by putting together an agenda that not only contains your company`s important issues but from a psychological perspective in combination with physical training, nutritious healthy food and drinks but also an understanding for how important rest, recovery and sleep is for your avtivity to become stable in the long run. 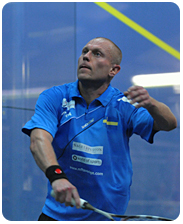 MFT Sweden Ltd have a unique cooperation with Enskede racket centre that can give your confernce new dimensions. 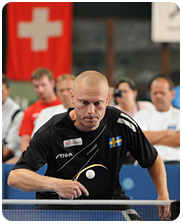 MFT Sweden Ltd give racketsport lessons in all four major racketsports tabletennis, badminton, squash and tennis to all levels of players from the beginner to the professional player. 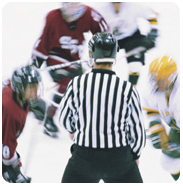 Focus is on technique, tactics, the physical – and the mental game. The lessons are individually adapted to suit the customers expectations and the instructors experience of what needs to be done to create the best possible pedagogic situation. Both single lessons and series of lessons are given all according to the customer`s needs and the instructor`s recommendations. Complementary PT-training is also possible to receive for instance if it´s necessary to be able to play racketsports on a certain level. If you are among those who would like to get lessons in only one of the four racket sports this is of course possible. You explain what you wish to improve technically, tactically, physically or mentally but can also receive the instructors recommendations. Some players have a good idea of what they want to improve and others feel stuck in their development and need someone else`s ideas to find a new development. Depending on which sport you would like to improve, it is possible to concentrate on different parts of the game to accomplish quickest possible result. The technically part of MFT Sweden´s pedagogical teaching deals with how to hold the racket, hit the ball, move on court or hit different shots from various positions of the court. Tactically MFT Sweden Ltd give guidelines for where to hit the ball depending on how the opponent acts, whether to play offensive or defensive, how to use the opponents weaknesses and to create space for your own good shots. The physical part includes strengthening your heart- and lung capacity, becoming more vigorous and developing stronger muscles but also how to move to make your pattern of movement more effective. The mental branch concerns issues like finding your way of thinking, feeling and behaving on court in order to get the most out of yourself at the moment of achievement or having a clear well thought mental strategy for dealing with inner processes that could be destructive to your game. If you are interested in becoming a better Racketlon player you might find it useful to invest in racketlon lessons where you get to play all four events consecutively and practice how to handle the transitions between the sports which can be very difficult if you are not accustomed to them. These lessons should be at least two hours long to get enough time to go through all events. 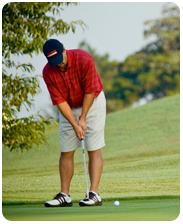 Of course you can take lessons including only two or three events as well all according to your needs. A very important aspect of Racketlon is to monitor the differences in techique between the events so that you do not end up playing with a squash tecnique on tenniscourt or a table tennis technique on the badminton court. It is necessary to get used to quickly adapt to new rackets, balls and motions. This is what the Racketlon lessons focus on especially. Another aspect of Racketlon that you do not find in the individual sports is that every point counts toward the final score which means that losing concentration during a couple of minutes in part of the match could be crucial to the outcome of the game. The mental strategy is not losing focus on what you need to do and learn how to come back fast into concentration between rallies if you loose it momentarily. 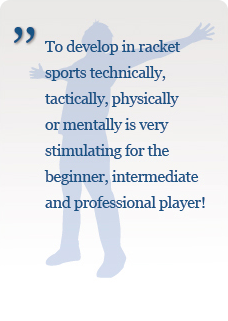 This mental aspect of Racketlon can create a lot of problems for players coming from the individual sports. It is also very easy to fall into the mental trap of trying to calculate what the score in each event might be depending on how good you think your opponent´s profile looks like which can create big disappointments if you underachieve and great moments of joy if you do better than expected. These kind of emotional outburst can turn Racketlonmatches around completely. Racketlon is extremely tough psychlogically since you have no chance to rest mentally during a game and the fact that you need to compete in events that you do not master technically well enough to feel confident. To become a good Racketlonplayer you need to learn how to focus on one point at a time without thinking about what has happened and what might happen. Racketlon is also more physically demanding than the events separately since it requires an allround athleticism, vigour, stamina, speed and timing which need to be more flexible than if you only play one sport. Because of this it might be a good idea to complement Racketlon lessons with weight training using free weights such as bars. You need to build up your abdominal, back and legs as they are the engine, control organ and power generator of a good Racketlon player. MFT Sweden AB can help you to construct your own weightlifting program to help you reach a higher Racketlon level. 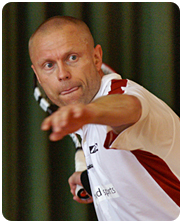 If you want to improve yourself as a racket sports player please contact MFT Sweden Ltd by entering your contact information under the headline contact. You are most welcome. 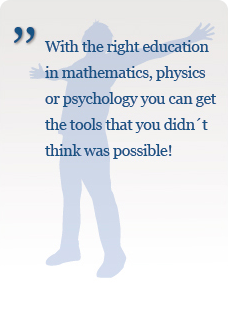 MFT Sweden Ltd gives private lessons in mathematics, psychology and physics from beginners to university level. The speciality is the pedagogic part of the teaching. Get help understanding or planning your mathematics and physics studies. Do you have problems with mathematics, psychology or physics in school? Maybe you are studying to build a new career and need some extra support in the high tempo of your education? Maybe you are studying for an examination and want to get answers to your questions the days before? Anyone who needs help in matchematics, psychology or physics can turn to MFT Sweden Ltd for assistance so that we together can find a way to get the desired results. If you feel you have problems planning your studies or need help structuring your thinking around how to make your studying more efficient you can get help from MFT Sweden`s pedagogic and logical plan for improving the results of your studies. Just send an e-mail under the headline contact at the top of the page! To be healthy in a sustainable way in the long run you need to keep balance in the system food – training – sleep, meaningful everyday activity, good economy and healthy relationships to people you love. MFT Sweden Ltd help you to find right nutrition, get your training going in a challening and motivating way and make sure you get enough quality sleep for you to feel recovered, filled with energy and positive to meet lifes challenges.